Stress is a normal part of life. We all experience it and as a result, look for ways to manage it. Personally, I turn to exercise, the occasional glass of wine ... or two, and (to the dismay of my imaginary personal trainer) comfort food. Admittedly, the last two might not be the healthiest ways to combat the negative side effects of stress, which is why I was beyond thrilled to discover this sculptural beauty. I know what you're thinking, "What kind of sorcery is this? And what does it have to do with stress?" So glad that you asked. 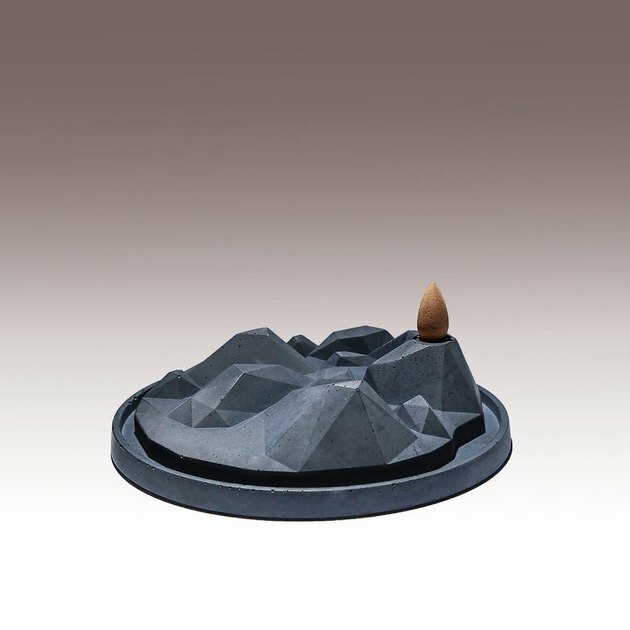 The simple answer: it's a concrete incense holder. Both first-generation Chinese immigrants, to the US and Australia respectively, Bill and Miranda are the husband and wife team behind Kin. The couple created the Shanghai-based brand as a way to reinterpret traditional Chinese history in a unique and modern way. Made from scratch, each product is imbued with rich cultural heritage. For instance, the misty mountains — which influenced this unique design — have always been treasured in Chinese culture as a place to seek peace and inspiration among other things. Also revered are incense (or "xiang" in Chinese) which were used centuries ago in Ancient China. This architectural design cleverly combines the two elements in a single concrete form. 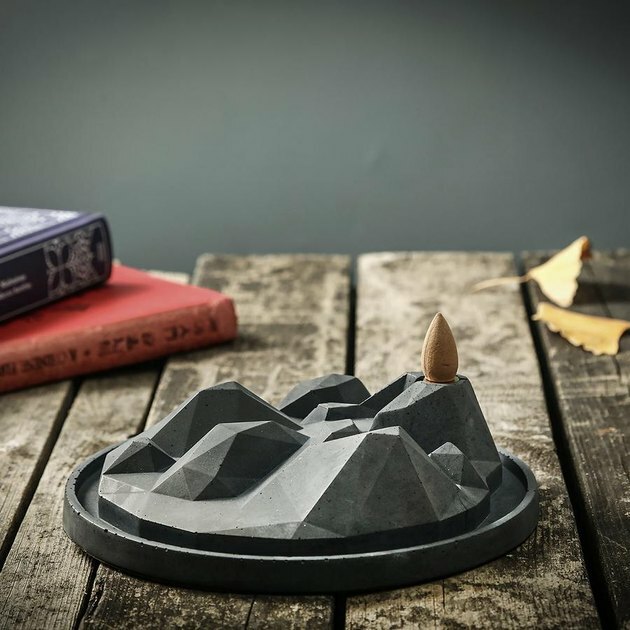 As the cone-shaped backflow incense — which sits at the highest peak — burns, the smoke travels downward into the carved valleys of the mountainscape, winding its way through every twist and turn like fog, until finally, it settles across the rugged terrain. Every time I watch the plume of smoke gracefully weave its way through every crevice, a sense of calm (and utter fascination ... I mean how do they do that?!) comes over me. Regardless of whether you chalk up my decreased blood pressure to inhaling the fragrant aroma of burning incense or to watching this misty magic act unfold, the bottom line is that this industrial piece of decor is probably a healthier stress reliever than inhaling a batch of brownies. Plus, it looks (and smells) incredible in my living room, acting as a daily reminder for me to breathe and appreciate the beauty found in everyday objects. 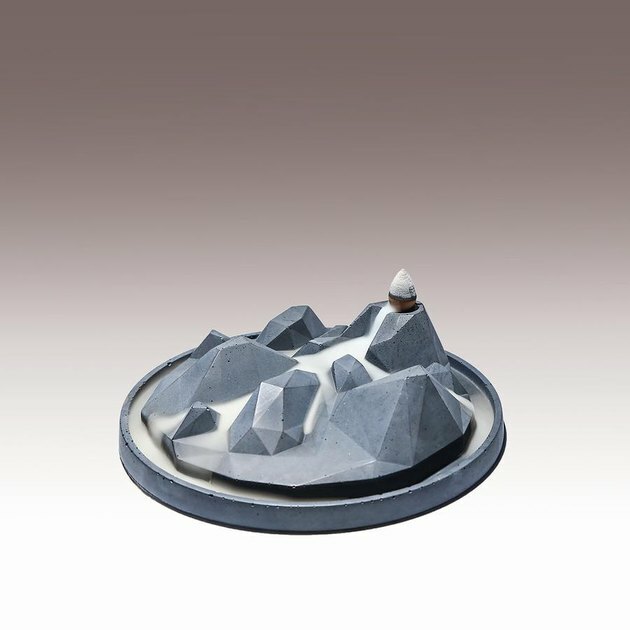 Valley of Fog Backflow Incense Holder, $55. Available at Kin Objects.